Nothing is better than eating a luscious cupcake except maybe eating one at Christmas, the best holiday of the year! 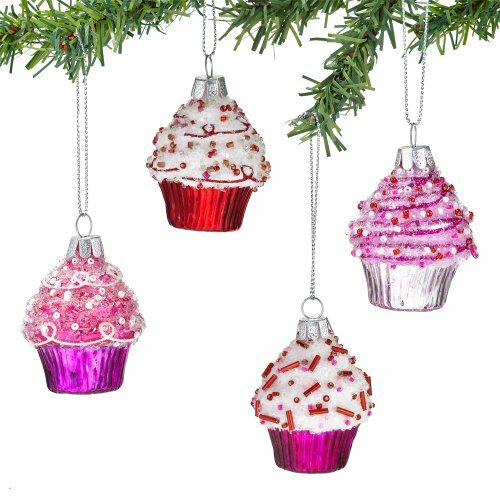 Bring the love of cupcakes into Christmas with cupcake ornaments. What about an entire cupcake themed Christmas tree? A cupcake tree would be perfect for the kitchen or dining room. 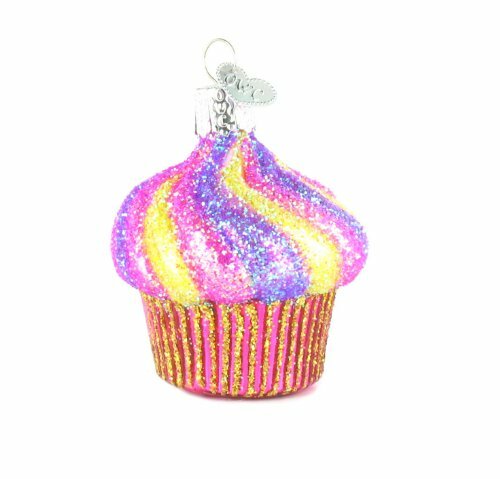 A cupcake ornament is perfect for your girlfriend who loves to go to the cupcake shop with you. Or give it to any sweetie in your life. Why Do We Love Cupcakes? Cupcakes used to be restricted to the domain of children's birthday parties. But it seems that now even adult men are in love with cupcakes. Cupcake shops are popping up all over cities. Even where the economy is fighting recession and unemployment is high, customers are willing to pay two to three dollars for a single cupcake. Amazing! What is the appeal of a cupcake? It is the diminutive size? The fun of peeling back the colorful wrapper? The creamy frosting, often piled inches high? Or is it the creative touches that so many bakeries add onto the cupcakes? Maybe we adults just want to go back to the time of happy birthday parties of our childhoods. When the family decorates the Christmas tree, it's a special time to remember ornaments of past years. Personalized ornaments are special because it's obvious whose ornament it is. There can be no confusion when the name is right there, printed on it. 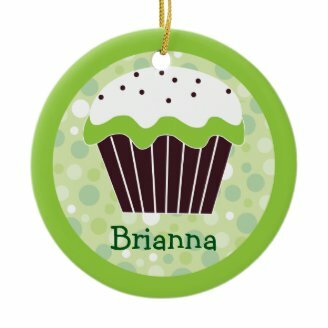 These disc ornaments from Zazzle feature pink or green cupcakes. Each can be personalized with a name or a message. These would make great stocking stuffers or reusable gift tags. Many families have a tradition of giving each child one or more ornaments each year. Then when that child leaves home to start her own family, she takes all her ornaments from her childhood to her new home. 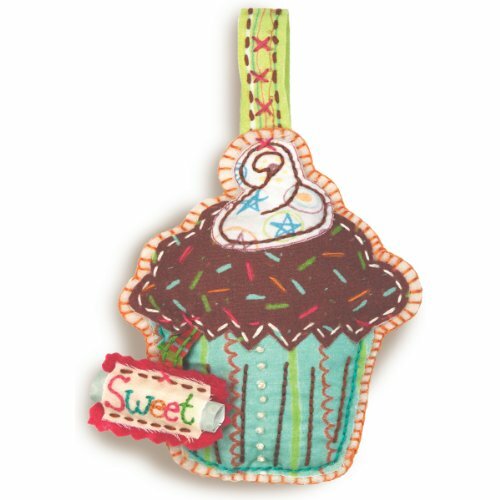 Any of these cupcake ornaments would be a great way to remember the years of the cupcake craze. Yes! On my tree, and on my plate! Yes, but only on a plate, please. Yes, but decorative ones are better than the real thing. No. Bah Humbug to cupcakes. The cupcake ornaments are a combination of traditional red and green colors with a heavy dose of pinks and purples. So a cupcake Christmas tree will probably be best done in jewel tones. 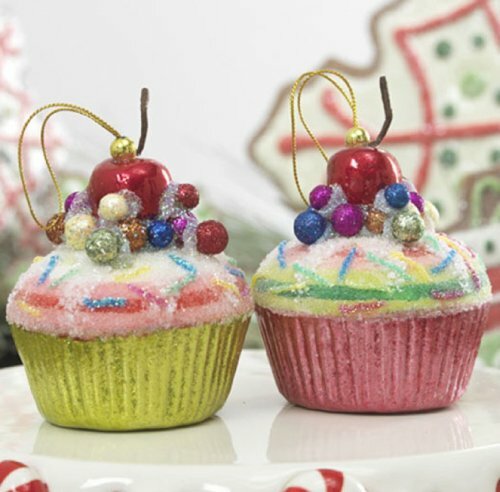 What else can you put on a cupcake Christmas tree? 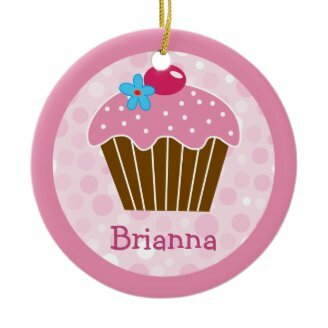 Besides your cupcake ornaments, embellish the cupcake tree with cookie cutters, kitchen related ornaments, candy ornaments, gingerbread men, and other sweet treats. Why cupcakes on a Christmas tree? One tradition we are all familiar with is putting gingerbread cut-outs on a Christmas tree. Those were originally cookies, real edible cookies that people made that time of year to celebrate the holidays. Today we eat cupcakes for most every celebration, including Christmas. Putting cupcakes on the Christmas tree makes perfect sense. Don't those ideals also suit Christmas perfectly? That's why cupcakes and Christmas are a perfect match. There are some beautiful ornaments here. Candy canes, gingerbread men... I think cupcakes are the perfect addition. No you're talking my language Jimmie! These are delicious looking. 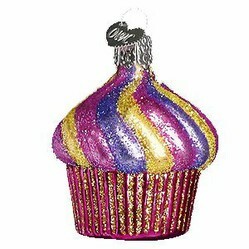 I love the decorations and glitter of cupcake ornaments. I've never seen mini cupcake ornaments. I'll have to keep my eyes open.